(Nanowerk News) Illinois chemists have used DNA to do a protein’s job, creating opportunities for DNA to find work in more areas of biology, chemistry and medicine than ever before. Led by Scott Silverman, a professor of chemistry at the University of Illinois at Urbana-Champaign, the researchers published their findings in the journal Proceedings of the National Academy of Sciences (The paper, “Catalytic DNA with phosphatase activity,” will be available on PNAS Early Edition this week). 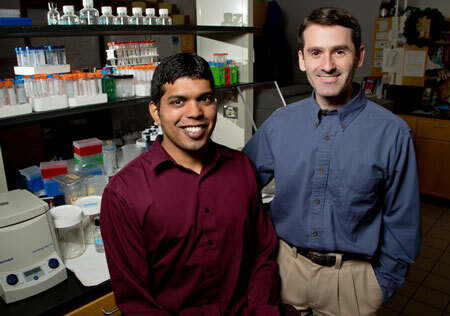 U. of I. chemists – professor Scott Silverman, right, and graduate student Jagadeeswaran Chandrasekar – synthesized a DNA catalyst that can perform a difficult reaction usually catalyzed by the protein enzyme phosphatase. Ideally, researchers would like to be able to design and build new catalysts from scratch that can do exactly what they want. Many enzymes make small modifications to the building blocks of proteins, amino acids, which can create large changes in a finished protein. However, designing – or even modifying – protein enzymes is a very difficult task, thanks to their complexity and size. One of the most important – and difficult – reactions in nature is the addition or removal of a phosphate group. In the realm of proteins, the amino acids serine and tyrosine can have phosphate added to or removed from them, which can alter the protein’s function or turn enzyme activity on or off. Without help from catalysts, such reactions take a very long time to occur – on the order of thousands to millions of years. So nature uses enzymes called kinases or phosphatases to catalyze these reactions. Silverman’s group identified artificial DNA catalysts that can do phosphatase’s job of removing phosphate from serine and tyrosine. Demonstrating that DNA can catalyze such difficult reactions is an important step forward in designing and using DNA catalysts. “At this point, this is basic science. We’re trying to figure out, what kind of reactions can DNA catalyze? And how do we find DNA catalysts that can catalyze these reactions?” Silverman said. To find the DNA catalysts that can perform a phosphatase reaction, the researchers used a process called in vitro selection. This method searches through vast numbers of DNA sequences to identify the few that could perform a specific activity. The researchers then synthesize those DNA strands and use them for various applications. The researchers tested their DNA catalysts’ activity in the presence of other large, non-specific proteins, to find out if they would function in an environment resembling the cell. The DNA catalysts were not bothered by the extra company, giving the researchers hope that one day their DNA catalysts could be used for practical applications in vivo. Next, the researchers will continue to refine the in vitro selection process and hope to identify more DNA catalysts, designing and building molecules to perform specific functions.